Citation Information: J Clin Invest. 2007;117(12):3664-3672. https://doi.org/10.1172/JCI28115. Mammalian TLRs are central mediators of the innate immune system that instruct cells of the innate and adaptive response to clear microbial infections. 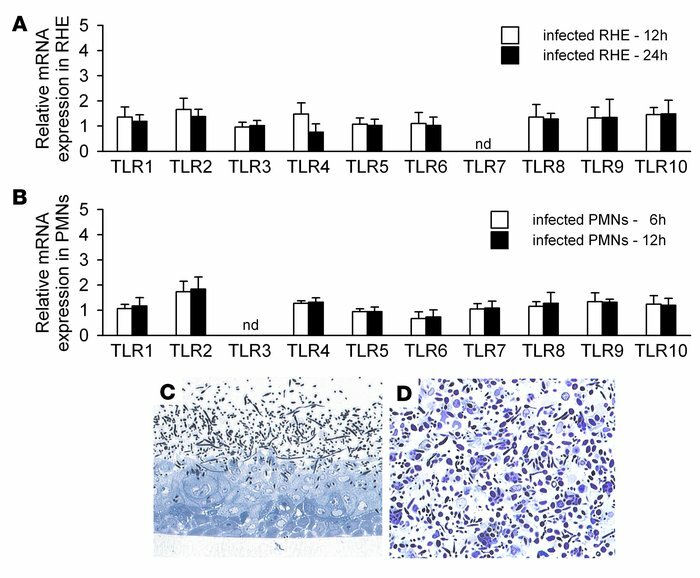 Here, we demonstrate that human epithelial TLR4 directly protected the oral mucosa from fungal infection via a process mediated by polymorphonuclear leukocytes (PMNs). In an in vitro epithelial model of oral candidiasis, the fungal pathogen Candida albicans induced a chemoattractive and proinflammatory cytokine response but failed to directly modulate the expression of genes encoding TLRs. However, the addition of PMNs to the C. albicans–infected model strongly upregulated cytoplasmic and cell-surface epithelial TLR4 expression, which correlated directly with protection against fungal invasion and cell injury. C. albicans invasion and cell injury was restored by the addition of TLR4-specific neutralizing antibodies and knockdown of TLR4 using RNA interference, even in the presence of PMNs, demonstrating the direct role of epithelial TLR4 in the protective process. Furthermore, treatment with neutralizing antibodies specific for TNF-α resulted in strongly reduced TLR4 expression accompanied by augmented epithelial cell damage and fungal invasion. To our knowledge, this is the first description of such a PMN-dependent, TLR4-mediated protective mechanism at epithelial surfaces, which may provide significant insights into how microbial infections are managed and controlled in the oral mucosa. Interaction of oral RHE and PMNs with C. albicans does not alter the constitutive levels of TLR1-10 expression. (A and B) TLR1–TLR10 mRNA levels in C. albicans–infected RHE (A, n = 6) and after coincubation of PMNs with C. albicans (B, n = 6). Values are normalized to housekeeping genes YWHAZ and G6PD and relative to uninfected RHE or PMNs (control, assigned as 1.0). nd, not detected. (C and D) Light micrographs of oral RHE 24 h after C. albicans infection (C) and of PMNs 12 h after coincubation with C. albicans (D). Original magnification, ×40.